Don’t say knockoff; say homage. So what’s the story of this look from the Spring 2012 3.1 Philip Lim collection? 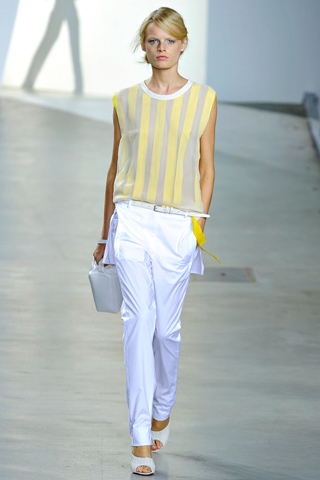 Blousy and slouchy lines, vertical highlights, simple accessories, and white paired with a neutral & bold yellow. Can we get the same effect with pieces that will work as an outfit, and still be of use with the rest of our wardrobe? I think so. Zara pleated blouse, Vintage Koret leather handbag, Victor Camuto braided leather belt, H&M linen/cotton trousers, Trotters white pumps. The “angry teenager” facial expression is optional.